Lake Ladoga, located in the northwestern part of Russia, is the largest lake in all of Europe. The lake lies within the borders of two political provinces: the Republic of Karelai and Leningrad Oblast. The cities of Priozyorsk, Shlisselburg, and Sortavala are located on its shores. 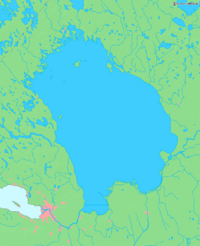 In total, Lake Ladoga covers an area of 6,700 fresh water square miles, excluding all 660 of the islands on the lake. The width of the lake averages 51 miles, while the length is approximately 136 miles. Along with its impressive size, the lake is also remarkably deep, measuring 167 feet on average. 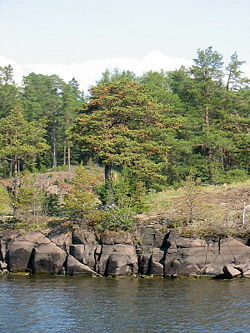 The deepest point of the lake is found just to the west of Valaam Island where the lake dips to 754 feet. Lake Ladoga served as a lifeline to the besieged Leningrad during World War II, connecting it with the rest of the Soviet Union. Lake Ladoga was formed as a result of glacier movements approximately 10,000 years ago. According to most geologists, the lake was originally part of the Baltic Sea that separated from the main body of water when the Yoldia Sea began to recede around 8,000 years ago. According to this theory, Lake Ladoga and the Baltic Sea continued to be connected by a small strait until the River Neva was fully formed. In approximately the twelfth century C.E., Lake Ladoga and the Baltic Sea were completely separated because the River Neva was filled with water flowing from Lake Ladoga into the river from the break at Porogi. The modern form of Lake Ladoga is completely navigable, and serves as an important commercial conduit between the Baltic Sea and the Volga River. In order to facilitate trade along the lake, a canal was built to cut through the southern part of the lake. Ladoga Canal, which connects the Neva to the Svir River, has contributed significantly to commerce by allowing vessels to bypass the southern loop of the lake. Lake Ladoga has approximately 660 islands, with a total area of 435 square kilometers. Most of the islands, including the famous Valaam archipelago, Kilpola and Konevets, are situated in the northwestern part of the lake. Vuoksi River from Lake Saimaa in Finland (west, discharge: 540 m³/s). Syas River (south, discharge: 53 m³/s). While the flow of water from these rivers helps to keep the water table of Lake Ladoga at an acceptable level for the aquatic ecosystem, precipitation also plays a part in keeping Lake Ladoga full. The lake receives approximately 13 percent of its water from precipitation, and while the percentage appears to be low, it would not be able to maintain a steady water level without annual rainfall. The Russian winter is strenuous for the aquatic environment of Lake Ladoga, as the lake completely freezes over every winter. Towards the beginning months of winter only the edges of the lake are frozen, leaving the center still passable. Until the middle of the lake freezes over in the middle of winter, however, the lake is subject to violent storms. In an attempt to alleviate the problems caused by the Russian winter on Lake Ladoga, a series of canals have been built around the exterior of the lake so that vessels may pass in all weather. The shores that fringe the lake also differ dramatically, due to the massive size of the lake and the variety of environmental occurrences that contribute to its ecosystem. Towards the northern edges of the lake the shores are considerably high and craggy, with deep insets. To the south, the opposite holds true, and the beaches are sandy and low lying. The diversity of solid land terrain fringing the lake represents the diversity of ecosystems that are combined within Lake Ladoga. Surrounding soil is not the only thing to vary in the lake area, with the Lake also boasting an extremely diverse aquatic ecosystem. Over 48 different forms of fish life have been reported in the lake, including roach fish, carp bream, sander, and European perch. Lake Ladoga is also one of the few marine environments to host the endangered Atlantic sturgeon, famed for its eggs that are used in high quality caviar. 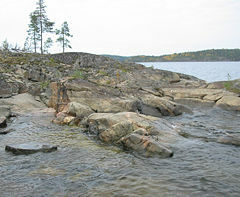 In addition to fish life, Lake Ladoga is the home of the Ladoga Seal, a species of ringed seal only found in the lake. Following World War II, Lake Ladoga began to be consistently over-fished in an attempt to provide a much needed boost to the economy. Despite the intentions of such extensive fishing, however, fishing without regulations proved detrimental to the commercial fishing industry as a whole by lowering the amount of fish in the lake. In turn, commercial fishing boats began to report smaller catches and lower profits. Recognizing the potential for economic disaster, the Russian government has taken some steps to regulate commercial fishing on Lake Ladoga, namely by prohibiting trawling in 1956. Lake Ladoga, due to its broad size and important location, played an important role in trade beginning in the Middle Ages. At that time, commercial traders used the lake to transfer goods from the Varangians to the Greeks. Because of the economic importance of the access route, the area soon came under political contention, as both the Novgorod Republic and Sweden claimed the territory as their own. In order to defend against the military advances of encroaching empires, the fortresses of Korela and Oreshek were built along the shores of the lake. Mirroring the military build-up of the lake shore, religious societies also sought the peaceful shores of Lake Ladoga. The first monastery on the lake, Valaam Monastery, was formed on the island of Valaam. The monastery soon fell into ruin, and was not rebuilt until the twentieth century. 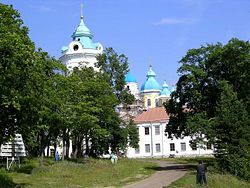 Other significant monasteries in the region included the Konevets Monastery (on the Konevets Island) and the Alexander-Svirsky Monastery. All of the military fortresses along the water's edge failed to protect the lake from invasion during the Ingrian War. During this conflict, the shores of Lake Ladoga became a hotly contested point between the warring countries of Russia and Sweden. When it came time to strike a peace at the end of the war, sections of the northern and western coast were given to Sweden by Russia as part of the peace treaty. Later, in 1721, the debated parts of the shoreline were restored to Russia as the result of another treaty. Partially due to the continued military conflict over the lake shores, militarization of the lake was severely restricted with the 1920 Tartu Peace Treaty. During World War II, Lake Ladoga became a scene of international naval powers operating within close proximity of one another. Vessels of the German and Italian navy, as well as parts of the Finnish and Soviet fleets, were found on the lake during the war. At one point during the war, Leningrad was placed under siege conditions, and the only way to access the city was through the lake. In order to provide much needed supplies to the city, trucks were driven over the frozen lake in the winter and boats carried supplies in the summer. As a result of the war, Lake Ladoga was once again returned to Russian dominion. This page was last modified on 20 June 2018, at 14:37.